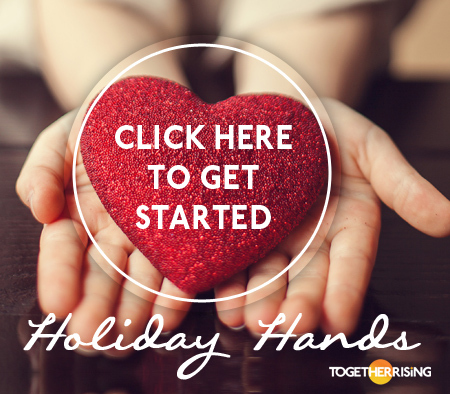 Holidays Hands is Together Rising’s annual love offering heading into the holiday season in which we as a community remind ourselves that We Belong To Each Other. Holiday Hands is a place for people who need a little extra during this holiday season to tell us their need. It is a place for people who have a little extra during this holiday season to meet someone’s need. It is a place for people who have just enough to witness the miracles that happen when a community shows up for each other. If you are someone who has a little extra this season, we are so thankful you’re here. Please come back here on Tuesday, November 13, when we will open up the needs of our community to be met by our community. We are grateful for your kindness and believe you will find a heartwarming, memorable holiday connection. If you are someone who has just enough, we’re so thankful you’re here. Please share this project with your friends who may have needs, or may have extra, and then come back on Tuesday, November 13 to experience some holiday miracles. We are grateful for your witness. Each Holiday Hands, we marvel at how some people who were receivers the year before come back to be givers the next year, and people who gave during one year ask for help another year. This is beautiful. This is what it means to be in community, to celebrate the cycle of loving and being loved — giving and receiving. This is what it means to belong to each other.